With Salzburg being something like a naturally grown Disneyland, it is a much desired destination not only for attending "The Sound of Music Dinner Show", but also hundreds of weddings every year. As Schloss Mirabell Castle serves as a city hall and administrative building for Salzburg, the Marble Hall is the site of many dream-style weddings. By the way, once the marble hall served as a concert venue to Wolfgang Amadeus Mozart, which adds another asset to the place. It is by far not only locals from Salzburg who enjoy the privilege of getting married in Baroque decadence: in fact, the Marble Hall is a popular place for weddings especially with international visitors who enter in elaborate wedding dresses and start from Mirabell Castle to tour Salzburg after exchanging rings in one of the frankly rather tacky horse and carriages. Whilst most locals rely on their own knowledge of the scene in Salzburg, international wedding tourists often hire agencies and professional wedding planners to arrange everything from wedding dress to invitations, gifts and the obligatory wedding cake. 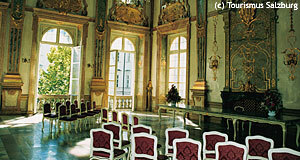 In fact, it is no problem at all to get married in Salzburg as an international visitor. Promotional video of the city of Salzburg's wedding office (Standesamt). It wouldn′t be Salzburg with its 250 years of experience in pimping out Mozart hadn′t it made weddings a branch of its flourishing tourism industries. Even the tourism council offers advice for wedding vacations, making Salzburg a somewhat bizarre Baroque Las Vegas with Alpine scenery in the background. Weddings take only 20 minutes and especially in the sunny season (mid-August to late August - joke, spring to late summer), the weddings in Mirabell Castle smell a bit of mass production. But to be fair: it is most likely one of the most extravagant settings you could possibly rent for a wedding, exchanging rings in a representative hall of a Baroque castle in the heart of Europe. The Donnerstiege staircase is decorated with marble angles, which is often considered to be a good sign. However, look for one of the angles at the bottom of the staircase: it clearly points with one finger at its front, as if it was about to indicate that the groom might be a bit silly to make that step.